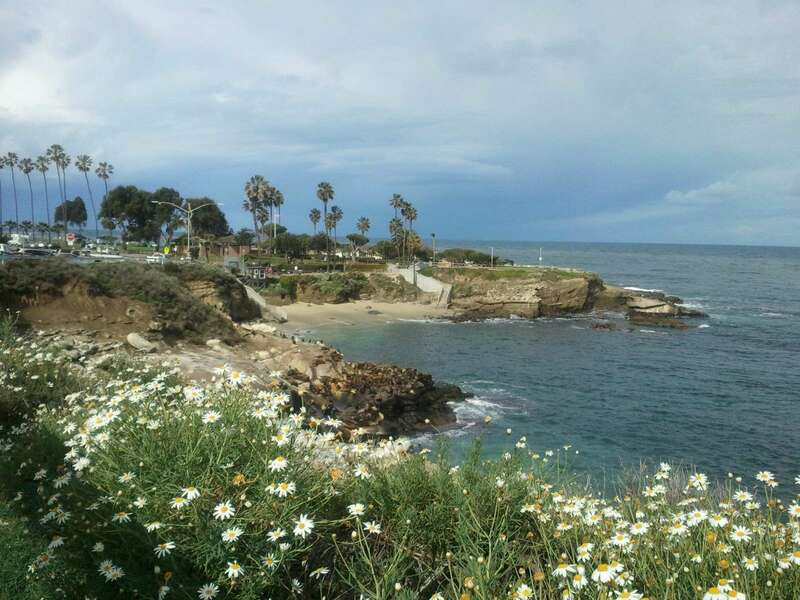 Sample images from a complimentary copy of a Windows-based screen saver depicting Historic Postcards of La Jolla. Click image above for download instructions. San Dieguito Partnership, L. P., vs. City of San Diego et al. A lot line reconfiguration of 9 parcels was attempted by the owners of 189 acres. Five of the parcels had no frontage to the street, and the lot line adjustment was proposed so that all 9 parcels would have frontage. A city attorney maintained that because the proposal seemed to be a creation of more than 5 lots, compliance with the Subdivision Map Act, which is Government Code Section 66410 et seq., was required. The owners petitioned the court for a writ of mandate in order to force the city to deal with the request as a lot line adjustment. The Subdivision Map Act does not apply to lot line adjustments (see, Government Code Section 66412, subd. (d)). However, the trial court agreed with the city attorney, finding the request outside of the lot line adjustment provisions. The owners’ petition for writ of mandate was denied. The trial was held in the Superior Court of San Diego County under Judge Michael I. Greer, Case No. 624087. The trial court found the reconfiguration was not within the lot line adjustment provisions and denied the petition for a writ of mandate of the owner, San Dieguito Partnership, L. P., (Owner) seeking to compel the City of San Diego (City) to treat it as such. We conclude the lot line adjustment provisions of section 66412, subdivision (d), exempt from the SMA an adjustment of the type sought here and require the City to approve the adjustment subject only to a determination whether it conforms to City’s zoning and building ordinances. There is no statutory language or indication of a legislative purpose to limit lot line adjustments to "minor" ones as the City argues and the trial court concluded. To the contrary, the express prohibition against a City’s requiring a tentative map, parcel map or final map as a condition to approval of such an adjustment denotes a legislative purpose to include adjustments involving five or more lots within the application of section 66412, subdivision (d), if the proposal otherwise meets the statutory criteria. Thus, we reverse. A-1-10 Zone—Agricultural (10-acre minimum lots). FPF Zone—Floodplain fringe overlay zone. Future Urbanizing—General plan development phasing designation. Coastal Zone—State of California designation. San Dieguito River regional plan. When the City’s first progress guide and general plan was adopted in 1967, Owner’s land was designated for agricultural use. In 1972, the A-1-10 agricultural zone was applied to Owners’ land, permitting not only agricultural uses but also open space, commercial and private stables, single family homes, churches and uses approved by conditional use permits. The A-1-10 zone regulates permitted uses and establishes property development regulations such as minimum lot size and property setbacks. In 1976, portions of the Owner’s property were zoned floodway (FW) and floodplain fringe (FPF), as an overlying zone, so as to regulate and control development in areas subject to flooding. Estimating by eyesight on the certificate of compliance plat, between one-third and one-half of the acreage on the Western side of the existing parcels is zoned FPF. Only existing parcel 9 does not contain some FPF zoning. Each of the existing parcels 1, 2 and 3 contains a triangular portion of acreage zoned FW consuming approximately a quarter or less of the acreage of those three existing parcels. No residential use is allowed in the FW zone and there are property development restrictions in the FPF overlay zone additional to those in a base A-1-10 zone. In 1979 City adopted a major general plan revision identifying Owner’s land as open space and, for purposes of phasing or timing of development, as future urbanizing. Under the general plan, land in a future urbanizing area is to be held as an urban reserve, to be released for development as the planned communities are built or as opportunities to implement the balanced housing or land use goals of the City arise. The land in question is subject to additional development regulations of the state Coastal Commission. It is also subject to City’s 1984 San Dieguito River Regional Plan which is intended to provide a comprehensive planning framework for this river basin. The regional plan designates Owner’s land for agricultural and recreational open space uses and contains a number of goals, one of which is to "[p]rotect and preserve significant natural, cultural and aesthetic resources, including the visual integrity of the River basin." These goals are guidelines and they refine the provisions of the general plan. The 189 acres also are included in a proposed 215-acre, 20-lot subdivision known as Stallions Crossing for which an application has been in process since September 1989. (Application No.89-1145.) Based on an environmental initial study of the Stallions Crossing project indicating it "may result in significant environmental impacts,"2 an environmental impact report (EIR) is being prepared. As of October 1990, the environmental analysis section of City’s planning department was in the process of reviewing and commenting on the first draft EIR prepared by Owner’s environmental consultants.3 In connection with Application No. 89-1145 and the requirements of City’s Resource Protection Ordinance, in November 1989 Owner stated it had no intention of constructing residences, but rather "will sell the lots individually or in bulk to a builder/developer." Using the COC method suggested by the City and relying on the lot line adjustment provisions of section 66412, subdivision (d), Owner submitted its request to the City in March 1990. In April 1990, the chief deputy city attorney, opined that a COC could not be used to create parcels or adjust lot lines. He described this case in part as one involving the same total number of lots but proposing "numerous lots . . . where none existed before" and one "which proposes to create more than five lots," thus requiring a tentative and final map under the SMA. In May 1990, City’s planning department notified Owner’s civil engineer that a tentative and final map would be necessary. Owner sent another letter expressing disagreement with the City’s position and requesting a lot line adjustment identical to the original request for the COC. City refused to process Owner’s proposed lot line adjustment. The present petition for writ of mandate was filed three days before Owner’s second request for a lot line adjustment. The petition sought to compel City to accept for processing and to process the lot line adjustment and approve it if it met statutory standards. After a hearing in November 1990, the trial court denied the petition. The trial court agreed with the City’s interpretation of the legislative intent behind the exemption in section 66412, subdivision (d), that there is a limit to the number of lots which may be adjusted under the exemption and that it is intended to permit only minor changes in parcel lines without requiring the processing of an entire subdivision map." (Original italics.) The court found that normal precepts of statutory construction support City’s administrative decision the proposed lot line adjustment "created more than 5 lots, and therefore required the filing of a tentative map and final map." The court cited certain provisions of the SMA, including the requirement of a tentative and final map "for all subdivisions creating five or more parcels" (§ 66426), and cases stating the purposes of the SMA. It expressed the belief that permitting the lot line adjustment would enable the Owners to avoid important statutory requirements and safeguards such as the guidelines in the General Plan of Open Space and Future Urbanizing, and the guidelines in the San Dieguito River Regional Plan. The court relied on a passage in California Subdivision Map Act Practice (Cont.Ed.Bar 1987) section 2.12, page 29, in which it is said, "The idea behind this exemption is to permit minor changes in parcel lines without requiring the processing of an entire subdivision map." (Italics added.) It found "the proposed multiple lot line adjustments, which would create 9 reconfigured parcels involving over 189 acres in an environmentally sensitive area, is not a minor change in parcel lines." The court went on to find section 66412, subdivision (d), "implies that land may not be taken from more than one parcel, and land may not be added to more than one adjacent parcel"; the SMA permits the City to make a preliminary determination as to whether a land division is legally exempt from the SMA; Owners fit within the definition of a "subdivider"4; the proposed reconfiguration is a "subdivision"5; and that since the statute grants the City authority to approve a proposed lot line adjustment, by reasonable implication, it also authorizes the City to disapprove a proposed lot line adjustment and to require tentative and final maps, given the language which includes the phrase "provided the lot line adjustment is approved by the local agency." "(d) A lot line adjustment between two or more existing adjacent parcels, where the land taken from one parcel is added to an adjacent parcel, and where a greater number of parcels than originally existed is not thereby created, provided the lot line adjustment is approved by the local agency, or advisory agency. A local agency or advisory agency shall limit its review and approval to a determination of whether or not the parcels resulting from the lot line adjustment will conform to local zoning and building ordinances. An advisory agency or local agency shall not impose conditions or exactions on its approval of a lot line adjustment except to conform to local zoning and building ordinances, or except to facilitate the relocation of existing utilities, infrastructure, or easements. No tentative map, parcel map, or final map shall be required as a condition to the approval of a lot line adjustment. The lot line adjustment shall be reflected in a deed, which shall be recorded. No record of survey shall be required for a lot line adjustment unless required by Section 8762 of the Business and Professions Code." Here, we apply the rule that if the language is clear, there can be no room for interpretation; effect must be given to the plain meaning of the words. (Building Industry Assn. v. City of Camarillo (1986) 41 Cal.3d 810, 818 [226 Cal.Rptr. 81, 718 P.2d 68].) The first sentence of the statute under consideration contains the elements of a lot line adjustment which makes the SMA inapplicable. The next three sentences impose limits or restrictions on the approving agency in dealing with an application for a lot line adjustment in whatever form the application may take. The final two sentences deal with procedural formalities of a lot line adjustment and need not be further mentioned. We deal first with the elements of a lot line adjustment spelled out in the statute. (2) It is especially noteworthy that the statutory language does not contain the word "minor" or any other words conveying the notion of a limitation of the number or size of parcels that may be affected by a lot line adjustment under its provisions, so long as "a greater number of parcels than originally existed is not thereby created." There is no question the lot line adjustment under consideration comports with the no greater number of parcels element. The existence of the no greater number of parcels element, the absence of other limiting words and the manner in which the language is phrased very directly suggest this is the extent of the Legislature’s limitation on the number of parcels which are permitted to be included in a lot line adjustment. It also suggests the Legislature’s determination, consistent with its definitions of "subdivider" and "subdivision" in which the dominant word is a variable of the verb "divide"6 (see fns. 4, 5, ante), that the dominant concern of the SMA is division of real property resulting in a greater number of parcels than existed before the division. The requirement of a tentative and final map "for all subdivisions creating five or more parcels" also involves "parcel[s] created by the division" (§ 66426, subds. (a), (b) and (d), italics added); in other words, new parcels which came about as a result of a division of real property. Thus, consistently with the Legislature’s definitional use of "division" involving the creation of parcels, the use of "created" in the lot line adjustment statute connotes a division resulting in more parcels with resultant application of the SMA to that division.7 If, however, a greater number of parcels is not so created by the lot line adjustment, there is no division of real property and the SMA is inapplicable. Likewise suggesting the Legislature was not concerned with the number of parcels which may be subject to a lot line adjustment is its use of the phrase "two or more" without attaching any maximum numerical limit. It surely would have been an easy task to attach such a limit had the Legislature so intended. There can be no question that the nine parcel lot line adjustment here involved fits within the two or more element. A. "A local agency or advisory agency shall limit its review and approval to a determination of whether or not the parcels resulting from the lot line adjustment will conform to local zoning and building ordinances." B. "An advisory agency or local agency shall not impose conditions or exactions on its approval of a lot line adjustment except to conform to local zoning and building ordinances, or except to facilitate the relocation of existing utilities, infrastructure, or easements." Thus, the regulatory function of the approving agency is strictly circumscribed by the Legislature in a lot line adjustment, with very little authority as compared to the agency’s function and authority in connection with a subdivision. In other words, the agency is not to deal with a lot line adjustment in a way similar to the way it deals with a subdivision. Certainly, when the lot line adjustment is within the language of the first sentence, the agency is not authorized to turn down a lot line adjustment approval request on the ground asserted here, that the lot line adjustment is a subdivision. Two additional points deserve mention. First, any of horribles sought to be created if these parcels in this lot line adjustment are not held to be subject to the SMA should be considered in light of the multitude of zoning and regional planning regulation applicable to this land. The situation is not one in which uncontrolled use of the land is available to the Owner. Part of the land in the FW and overlying FPF zones is subject to building restrictions; all of the land is apparently subject to a minimum 10-acre lot size along with open space requirements under the A-1-10 zoning; it is classified as Future Urbanizing held as an urban reserve; and it is subject to Coastal Commission and regional plan provisions. Governmental land-use planning and control is present with respect to this land, notwithstanding its exclusion from the SMA. Moreover, the 189 acres in question is part of a larger subdivision for which SMA approval was in process at the time the case was before the trial court. The land well may be subject to the SMA after all. The second point deserving mention is that, just as the statute does not mention such things as the amount of acreage or number of parcels that may be subject to a lot line adjustment and does not contain any mention of the word "minor," it also does not carve out any special consideration or contain any provision for "environmentally sensitive" areas which the trial court mentioned twice in its statement of decision. Thus, whether particular land is "environmentally sensitive" plays no role in determining the applicability of the statute. If the trial court factored the "environmentally sensitive" aspect into its decision, it erred. Judgment reversed. The trial court is directed to issue the writ as requested. Costs on appeal are awarded to Owner. 1.All statutory references are to the Government Code unless otherwise specified. 2.The areas where there may be significant environmental impacts are identified as: "land use, biology, hydrology/water quality and erosion, transportation/circulation (traffic/access) visual quality, landform alteration, cultural/scientific resources (archaeology and paleontology), geology and soils, natural resources (agricultural land), recreational resources, air quality (odors), noise, cumulative impacts and growth inducement." 3.About 98 percent of the Stallions Crossing project was included in an earlier application for a vesting tentative map and planned residential development permit encompassing approximately 347 acres straddling the San Dieguito River. (Application No.87-0998.) The project called for a 30-unit clustered residential development on an approximately 10-acre portion of the 347 acres. A City Planning Department study called for a full EIR and after it issued a draft EIR for public review in June 1989 and received numerous comment letters during the public review period ending in August 1989, it was requested not to issue a final EIR. Douglas M. McHenry, associate planner in the environmental analysis section of city’s planning department, opined that the 1987 application was withdrawn because "the EIR identified a significant unmitigated impact to land use and the applicant apparently believed that the project would not be approved." 6. "Divide" means simply to separate into two or more parts, areas, groups: to split up. (Webster’s New Internat. Dict. (3d ed. 1971) p.663.) In any division, of course, there are more parts after the division than there were before. 8.Consistent with this view of the meaning of adjacent is the Legislature’s specification in the definition of "subdivision" that "[p]roperty shall be considered as contiguous units, even if it is separated by roads, streets, utility easement or railroad rights-of-way." (§ 66424, ante, fn. 5, p.755.) Thus, the Legislature is not using "contiguous" in its commonly understood sense as involving property that is touching or adjoining. 9.The column on the left represents the parcel numbers of the two or more existing adjacent parcels between which there was a lot line adjustment. The column on the right represents the parcel number of the resulting parcel. 10.We have considered and excluded as possible authority for the trial court’s conclusion San Diego Municipal Code section 102.0207, which reads: "A parcel map or other recordable document may be used for the purpose of adjusting lot lines between adjoining lots provided the adjustment does not result in an increase in the number of lots. All lots or parcels must meet the minimum requirements of the Planning and Zoning Regulations and Building Code in regard to lot frontage, depth and area, and also all existing buildings must meet the minimum requirements for setbacks, lot coverage, parking, etc. The adjusted lot line(s) must be monumented in accordance with Sections 102.0204 and 102.0412 if applicable." 11.Each existing parcel has land taken from it and added to an adjacent parcel to result in a parcel with a different boundary configuration. It is true, however, that land from more than one existing parcel is added to one or more adjacent parcels in the case of all resulting parcels except resulting parcel 1. Resulting parcel 1 derives from having land taken from existing parcel 1 (as well as existing parcel 2), as permitted by the statute, bringing about resulting parcel 2. Thus, resulting parcel 1 is within the statute even though it does not consist of any land added from another parcel, but merely is a reduced version of existing parcel 1. 12.The trial court set forth the primary purposes and intent of the SMA as follows: "1. To encourage orderly community development by providing for the regulation and control of the design and improvement of the subdivision, with a proper consideration of its relation to adjoining areas (Santa Clara County Contractors etc. Assn. v. City of Santa Clara (1965) 232 C.A.2d 564, 572-573 [43 Cal.Rptr. 86] [disapproved on another point in The Pines v. City of Santa Monica (1981) 29 Cal.3d 656, 664 (175 Cal.Rptr. 336, 630 P.2d 521)]; [¶] 2. To ensure that the areas within the subdivision that are dedicated for public purposes will be properly improved by the subdivider so that they will not become an undue burden on the community (Bright v. Bd. of Supervisors (1977) 66 C.A.3d 191, 194 [135 Cal.Rptr. 758]); and [¶] 3. To protect the public and individual transferees from fraud and exploitation (Pratt v. Adams (1964) 229 C.A.2d 602, 606 [40 Cal.Rptr. 505])." 13.Amicus curiae, California Land Surveyors Association, points out that the Legislature added these three sentences in 1985. Amicus curiae argues these changes were intended to limit local entity review of lot line adjustments and provide mandatory approval of them if local zoning and building ordinances are satisfied. City concedes the "statute prohibits the conditioning of lot line adjustments so as to protect owners from onerous conditions." City argues, however, the statute does not prohibit it "from finding, under proper circumstances, that the lot line adjustment process is not appropriate and a subdivision map is required." In light of the clear statutory language, we cannot accept the City’s position that it may require a subdivision map based on its own finding "the lot line adjustment process is not appropriate," apparently by any standard it chooses. Worley, Schwartz, Garfield & Rice, Donald R. Worley and Jennifer Treese Wilson for Plaintiff and Appellant. McDonald, Hecht & Solberg, Charles R. Gill and Jill C. Wolfenzon as Amici Curiae on behalf of Plaintiff and Appellant. John W. Witt, City Attorney, C. Alan Sumption and Eugene P. Gordon, Chief Deputy City Attorneys, Larry E.
Renner and Leslie J. Girard, Deputy City Attorneys, for Defendants and Respondents. Copyright © , Pallamary & Associates. All Rights Reserved. Web design by Precision Computing Arts, Inc.